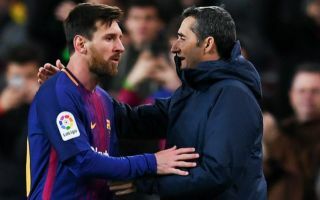 Barcelona manager Ernesto Valverde has reportedly held private talks with superstar Lionel Messi, with the Spaniard making a certain demand to the Argentine ace. Barca are still going very strong on all fronts this term, and we wouldn’t be surprised to see the Blaugrana win another treble come the end of the season given how they’ve been playing lately. The Spanish giants are currently seven points clear at the top of La Liga, into the Copa Del Rey final and into the quarter finals of the Champions League, something that suggests the club are going to end the season with one piece of silverware at the very least. However despite this, it doesn’t seem like manager Valvede is 100% happy with his Barcelona side, and particularly, with superstar Lionel Messi. As per Don Balon, Valverde has held private talks with Messi, with the Spaniard telling the forward to keep trying in La Liga and to not just switch his focus to the Champions League. The Argentine has scored 26 and assisted 14 in 25 La Liga appearances this term, a record that genuinely makes us think Messi is from another planet. Although the Champions League should be Barca’s priority, winning the league should still be something that ranks highly on Barca’s to-do list this year, even if they are 7 points clear going into the final 10 games!